It is notoriously difficult to photograph an owl. The stately birds tend to be close-taloned with their trust, requiring several months to become comfortable with even one human handler – a fact that explains both the rareness of intimate owl portraiture, and the magnificence of these shots by photographer Brad Wilson. Bringing the viewer into "common space" with any animal is a challenge, says Wilson. 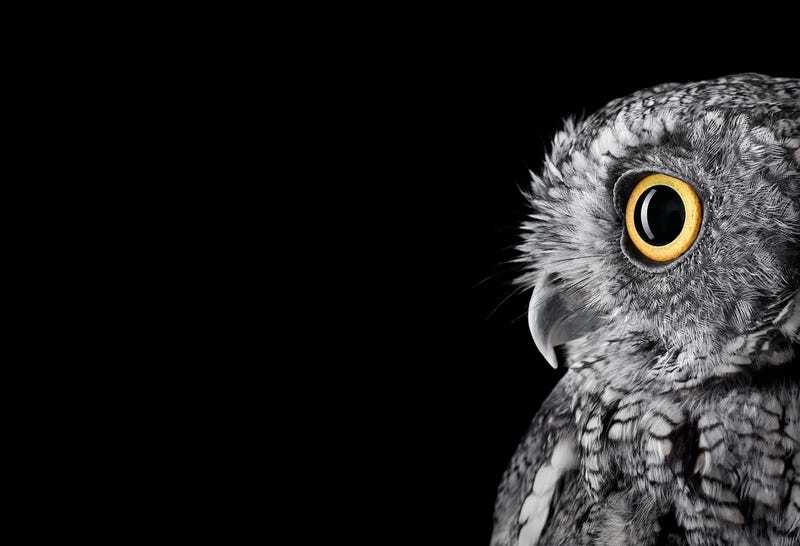 But the most difficult creatures to photograph by far are owls, he tells io9, adding that the hardest shot to capture of an owl is the direct eye contact you see featured in these images. "Owls, like most birds, are very slow to trust people," he says. "The animals I worked with are living in sanctuaries and need some degree of care by humans to survive." Typically, he says, a trainer must work with an owl one-on-one for a period of months before being fully accepted by the animal. "The funny thing is - the owl does not bestow that trust on any other human it doesn't know," says Wilson, "and will get aggressive if a stranger approaches." An owl's distrust of new faces – especially one hidden behind a big, professional camera rig – can be counterproductive during a shoot. "During the photo session I was never allowed to touch the subjects or even get really close to them," Wilson tells io9. "The entire time they were perched on a trainer's arm. Wilson says if he needed the owl positioned a certain way, the trainer would have to try and move his or her body accordingly. "However, this was always a tricky proposition, since owls can rotate their heads approximate 270 degrees, they tended to prefer looking away from me and towards the black background." "The frontal gaze was by far the hardest shot to get," Wilson says, "but, in the end, was the most compelling." "There's a starkness to it, a sense of isolation," says Wilson in this behind-the-scenes featurette on his work. There's a sense, he says, that "you're on equal playing field with this animal. You're inhabiting a space with it in a way that's much more immediate... than you get when" looking at, say, a photograph taken on safari. See more of Wilson's work on his website, and in his recently published book, Wild Life.